Suzanne’s Review of ‘Liberal Arts’!!! As we age, we mature…and sometimes we mature in different ways at different times. 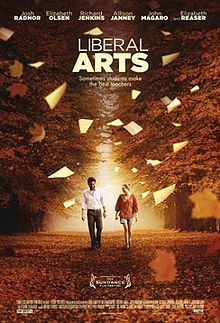 This is not a new concept, but in Josh Radnor’s Liberal Arts, we see a group of characters facing different periods of growth and adversity. The film may not reach new depths of introspection and understanding of the human condition, but it is one that many can enjoy simply for the recognition of ourselves in the characters. It’s been a few years since college, and Jesse (Radnor) has been out in the real world for a while. In the hustle of NYC he has lost his girlfriend, his job contentment and a great deal of his laundry. So when the opportunity to return to his alma mater to farewell his old professor, Peter Hoberg (Richard Jenkins), into retirement arises, he is very eager to escape the city and enjoy his old stomping grounds. While hanging out with Prof. Hoberg, Jesse meets a current student, Zibby (Elizabeth “Little” Olsen), and an instant connection is made in spite of a 16-year age difference. Though he is reluctant to hang out with Zibby because of her age, fate in the form of a crunchy granola character named Nat (Zac Efron) throws the two together for longer than expected during his visit. It is during this time that Jesse connects with another student as well – Dean (John Magaro). Dean is troubled, but Jesse is drawn to the quiet student because a love of the same author. In Jesse’s short stay he and Zibby get to know each other on a level that takes years for many to accomplish, and when he returns to NYC, they become pen pals – actual, written letters sent through USPS pen pals. These letters deepen their bond and they share thoughts and ideas that they haven’t shared with others. Zibby is able to open up in letters to someone older more than she is able to those her age, and Jesse, who felt alone and unenergized in the city, is getting a taste of those college years when people talked about their ideas, and all of it seems important. When Zibby asks Jesse to visit, he jumps at the chance. On his second return, Jesse and Zibby seem to be heading toward romance. But as he sticks around, it becomes apparent to him, that he is not right for Zibby. After running into Prof. Hoberg and separately Dean, it’s becoming more apparent that maybe he is not just visiting for Zibby, but for the way Zibby connects him to a different time. In the end, and in spite of her eagerness to be more than friends, Jesse makes the decision to leave even though it means breaking Zibby’s heart. Jesse returns to NYC and finds someone who understands him. He has grown enough to see who he is now and find contentment in that. After one last, unexpected trip back to the college, he and Zibby meet again, and she comes to understand why he did what he did. She has grown enough to recognize that as alluring as the idea of Jesse was, he’s not right for her. This movie included some fun performances by Allison Janney as another one of Jesse’s former professors, who though professes romantic literature, is really fed up and disillusioned with the world. Zac Efron is fun and spacey as Nat even though his time on the screen is short. And Richard Jenkins does a great job as a man who thinks he’s ready to leave the safe bubble of academia only to realize that he’s about to have to learn and grow in new and frightening ways. Josh Radnor continues to play that hopeful, I-believe-in-fate-and-true-love character from How I Met Your Mother, but it works so well for him. Little Olsen has actually surprised me, and it is easy to see her as a mature for her years young woman who still doesn’t quite get that she still has room to grow. The end of the movie has Jesse and his new love, Ana (Elizabeth Reaser), sitting on a couch, casually discussing old age. And as their conversation continues, they’re really talking about growing old together. It’s sweet; it means they’ve found the one. For the viewer, you realize (probably for the 500th time in your life) that you want that too – that someday when you barely recognize your reflection in the mirror, you want someone who still loves that reflection. Maybe this is a bit of a fluffy movie, but it is sweet and endearing and leaves you a little hopeful for what lies ahead in your life. Dallas International Film Festival Announces It’s Opening Film!!! This entry was posted on Friday, September 28th, 2012 at 6:50 pm	and is filed under Film, News. You can follow any responses to this entry through the RSS 2.0 feed. You can skip to the end and leave a response. Pinging is currently not allowed. « Suzanne Reviews ‘Won’t Back Down’!!! Now, no more shenanigans, no more tomfoolery, no more ballyhoo.